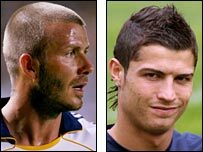 Former Manchester United star David Beckham has urged Cristiano Ronaldo not to follow in his footsteps by leaving Old Trafford to sign for Real Madrid. The Spanish giants are tracking the 23-year-old, despite being warned off by United manager Sir Alex Ferguson. Beckham, who joined Real in 2003, said: "I believe he's at the right club now, a club he should stay at. "He's only been there a few years. He's got a lot of people around him there who will protect him." Beckham added: "As much as Real are a great team and one of the biggest clubs in the world, he's only just starting at United." Ronaldo, who scored 42 goals as his side won the Champions League and the Premier League last season, says he will clarify his future in the next few days. Ferguson is sure the Portuguese winger will stay, saying: "I'm confident about that. I'm very confident. "It's a game Real play all the time, In the past they've done it with Beckham, they've done it with Ronaldo, they've done it with my fitness coach last summer when they took him away from us, so we're used to it. "It's a compliment to the standard of players we have, and we always seem to produce, but I am more than confident Cristiano will be with us next year." "The Glazer family will not be messed about in this situation. "We want Cristiano to stay for a long, long time. He is on a fantastic contract and quite rightly so - he's the best player in the world."